The underlying data is often accessible using df.data.x, but should not be used, since selections and filtering are not reflected in this. However sometimes it is useful to access the raw numpy array. A better way, if you need a numpy array (for instance for plotting, or passing to a different library) it to use evalulate, which will also work with virtual columns, selections and filtered DataFrames (more on that below). Most numpy function (ufuncs) can be performed on expressions, and will not result in a direct result, but in a new expression. Sometimes it is convenient to store an expression as a column, or virtual column, a column that does not take up memory, but will be computed on the fly. A virtual column can be treated as a normal column. Vaex can be efficient when exploring subsets of the data, for instance to remove outlier or to inspect only a part of the data. Instead of making copies, internally vaex keeps track which rows is selected. Selections can be useful if you want to change what you select frequently, as in visualization, or when you want to compute statistics on several selections efficiently. Instead, you can also create a filtered dataset, and is similar in use to pandas, except that it does not copy the data. A core feature of vaex, and used for visualization, is calculation of statistics on N dimensional gridf. This results in a numpy array with the number counts in 64 bins distributed between x = -10, and x = 10. We can quickly visualize this using matplotlib. We can instead of doing 1d binning, do it in 2d as well (N-d actually), and visualize it using imshow. Most visualization can be done in 1 and 2d, and vaex wraps matplotlib to provide most use cases. The simpelest visualization is a 1d plot using DataFrame.plot1d. When only given one arguments, it will show a histogram showing 99.8% of the data. These objects are very similar to vaex’ expression, in that they represent an underlying calculation, while normal arithmetic and numpy functions can be applied to it. However, these object represent a statistics computation, and not a column. These statistical objects can be passed to the what argument. The advantage being that the data will only have to be passed over once. A similar result can be obtained by calculating the statistic ourselves, and passing it to plot1d’s grid argument. Care has to be taken that the limits used for calculating the statistics and the plot are the same, otherwise the x axis may not correspond to the real data. The same applies for 2d plotting. While filtering is useful for narrowing down a selection (e.g. df_negative = df[df.x < 0]) there are a few downsides to this. First, a practical issue is that when you filter 4 different ways, you will need to have 4 different objects, polluting your namespace. However, more importantly, when vaex executes a bunch of statistical computations, it will do that per DataFrame, meaning for 4 different DataFrames (although pointing to the same underlying data) it will do a total of 4 passes over the data. If instead, we have 4 (named) selections in our dataset, it can calculate statistics in one single pass over the data, which can speed up especially when you dataset is larger than your memory. In the plot below, we show three selection, which by default are blended together, requiring just one pass over the data. Lets say we would like to see two plots next to eachother, we can pass a list of expression pairs. By default, if you have multiple plots, they are shows as columns, multiple selections are overplotted, and multiple ‘whats’ (statistics) are shows as rows. However, this behaviour can be changed using the visual argument. If a 3rd axis (z) is given, you can ‘slice’ through the data, displaying the z slices as rows. Note that here the rows are wrapped, which can be changed using the wrap_columns argument. While vaex provides a wrapper for matplotlib, there are situations where you want to use the DataFrame.plot method, but want to be in control of the plot. Vaex simply uses the current figure and axes, so that it is easy to do. Using healpix is made available by the vaex-healpix package using the healpy package. Vaex does not need special support for healpix, only for plotting, but some helper functions are introduced to make working with healpix easier. By diving the source_id by 34359738368 you get a healpix index level 12, and diving it further will take you to lower levels. To understand healpix better, we will start from the beginning. 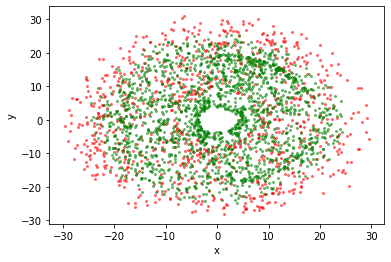 If we want to make a density sky plot, we would like to pass healpy a 1d numpy array where each value represents the density at a location of the sphere, where the location is determined by the array size (the healpix level) and the offset (the location). 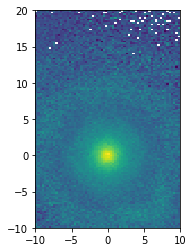 Since the Gaia data includes the healpix index encoded in the source_id. By diving the source_id by 34359738368 you get a healpix index level 12, and diving it further will take you to lower levels. We will start showing how you could manually do statistics on healpix bins using vaex.count. We will do a really course healpix scheme (level 2). And using healpy’s mollview we can visualize this. To simplify life, vaex includes DataFrame.healpix_count to take care of this. In science we often deal with measurement uncertainties (sometimes refererred to as measurement errors). When transformations are made with quantities that have uncertainties associated with them, the uncertainties on these transformed quantities can be calculated automatically by vaex. Note that propagation of uncertainties requires derivatives and matrix multiplications of lengthy equations, which is not complex, but tedious. Vaex can automatically calculate all dependencies, derivatives and compute the full covariance matrix. Even though the TGAS dataset already contains galactic sky coordiantes (l and b), we add them again as virtual columns such that the transformation between RA. and Dec. and the galactic sky coordinates is know. We now let vaex sort out what the covariance matrix is for the cartesian coordinates x, y, and z. And take 50 samples from the datasets for visualization. For this small dataset we visualize the uncertainties, with and without the covariance. From the second plot, we see that showing error ellipses (so narrow that they appear as lines) instead of error bars reveal that the distance information dominates the uncertainty in this case. As mentioned in the sections on selections, vaex can do computations on a DataFrame in parallel. Often, this is taken care of, when for instance passing multiple selections, or multiple arguments to one of the statistical functions. However, sometimes it is difficult or impossible to express a computation in one expression, and we need to resort to doing so called ‘delayed’ computationed, similar as in joblib and dask. Note that now the returned value is not a promise (TODO: a more Pythonic way would be to return a Future). This may be subject to change, and the best way to work with this is to use the delayed decorator. And call DataFrame.execute when the result is needed. In addition to the above delayed computation, we schedule another computation, such that both the count and mean are execute in parallel such that we only do a single pass over the data. We schedule the execution of two extra functions using the vaex.delayed decorator, and run the whole pipeline using df.execute(). Note: The interactive widgets require a running Python kernel, if you are viewing this documentation online you mean get a feeling for what the widgets can do, but computation will not be possible! Using the vaex-jupyter package, we get access to interactive widgets. The simplest way to get a more interactive visualization (or even print out statistics) is to the the vaex.jupyter.interactive_selection decorator, which will execute the decorated function each time the selection is changed. After changing the selection programmatically, the visualization will update, as well as the print output. The default join, is a ‘left’ join, where all rows for the left DataFrame (df1) are kept, and matching rows of the right DataFrame (df2) are added. We see for for the columns b and y, some values are missing, as expected. A ‘right’ join, is basically the same, but now the roles of the left and right label swapped, so now we have some values from columns x and a missing. Other joins (inner and outer) aren’t supported, feel free open an issue on github for this. Lets start with a function that converts from two angles, to an angular distance. The function assumes as input, 2 pairs on angular coordinates, in radians. Although the function above expected numpy arrays, vaex can pass in columns or expression, which will delay execution till needed, and add the resulting expression as a virtual column. When we calculate the mean angular distance of a taxi trip, we encounter some invalid data, that will give warnings, which we can savely ignore for this demonstration. This computation uses quite some heavy mathematical operation, and since it’s (internally) using numpy arrays, also uses quite some temporary arrays. We can optimize this calculation by doing a Just-In-Time compilation, based on numba or pythran. Choose whichever gives the best performance or is easiest to install. We can that we can get a significant speedup (\(\gt 4 x\)) in this case. String processing is similar to Pandas, except all operations are performed lazily, multithreaded, and faster (in C++). Check the API docs for more examples.